It is so cool to have a winery in your hometown. Only ten minutes by car it took me to arrive from my home to Bruno’s house settled just above Lungomare – the most popular beach coastline in Pula. Although Pula is not a big town, with a population of around 60.000, it is more famous for shipbuilding and rock concerts than for any kind of agriculture. And yet, there I was surrounded with barriques and large inox barrels and wine tasting was about to start. Bruno’s wine cellar is not a fancy one with stone bricks and arcs, just a plain and simple garage where temperature is controlled by an air-conditioner. Is it hard to be an urban winemaker? Where do your grapes come from? Everything comes from our vineyards near Šišan and Šikići where we grow istrian malvasia, cabernet sauvignon, chardonnay and syrah. There we have red soil of excellent minerality and drainage capabilities. Although it is just 1o km east of Pula, it is a quite wild area and often we have nasty wild boars who are intelligent enough to eat the juciest and sweetest grapes in the row. The south of Istria has a very dry and hot climate. Do you have problems with the lack of acidity? It is true, but we try to cover the grapes with leafs. What helps us is also the fresh sea-breeze that during the summer blows during the night. The vineyard is located just few kilometers west of the east coast of Istria. I heard that you are building a new wine cellar? Yes, it will be in Šišan, just few kilometers from our vineyards. That will make our life a bit easier during the vintage time and the grapes will be processed in a much shorter time. I am already warning people that they should not expect a rustic building in traditional istrian style, just pure concrete, modern architecture, and coloured epoxy resin on the floor. Unfortunately, we are not going to finish it for the upcoming vintage. Not a bad idea! Let’s see what we can do about it. Then, we started tasting of wines made in 2008. A fresh and fruity Chardonnay full of earthy aromas, entirely made in Inox, will be ready in 6 months. A violent 100% Cabernet Sauvignon with a juicy and peppery aromas, strong tannins and pronounced freshness, a very easy to drink wine atypical for young cabs. Than we tasted Syrah from 2008 that was maturating in barriques made of Slavonian, French or American oak. His Syrah impressed me immediately! Usually I am not a great fan of reds from Istria (apart of some autochtonous Teran made in traditional way) but this wine was definitely something different. Aromas were intense, fruity, animal, and almost smoky, still not nicely composed in a bouquet but what can you expect from such a young wine? 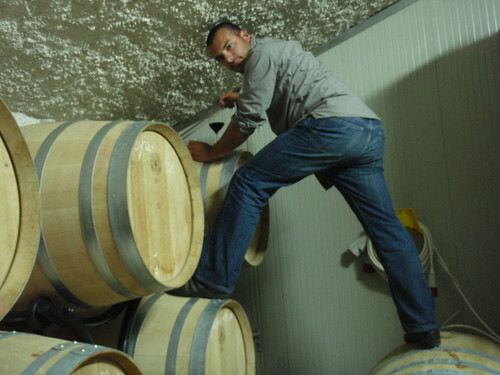 Each barrel had its own story to tell and the one made of American oak was placed so high that Bruno had to demonstrate his free climbing capabilities to take the sample from it. But the evening was not about to end. After fast and tasting of practically all barrels in Bruno’s cellar, we finally sat down on the terrace. I finally took my notebook out since my memory starts to be a weak point during the degustations. His wife joined us at the table but she was only sniffing the wines since they are expecting a baby (congratulations!). Bruno was jealous on her “…nose of a professional wine taster” and that she is able to quickly name some not so frequent aromas. We tried Bruno’s latest Istrian malvasia Ponente 2008, the most lucrative product of Trapan winery, the battle horse of the company. It was very similar to the one from 2007 I recently reviewed – a crisp and aromatic wine, with aroma of green grass and white flowers, with delicious mouthwatering minerality in the finish. But there was an improvement – the bitterness that was slightly present in 2007 version has disappeared, which made the finish much more elegant and silky. Hey Bruno, this malvasia does not has a bitter finish! Well done. We just took more care in the vineyard to get healthy grapes, that’s the whole trick. But I do not mind a bit of bitterness if it is of nice quality. Instead, my father is happy, he likes the “sweetness” of the 2008 version. Not that it has some sugars in it, it is the sweetness of the polyalcohols that you feel. Can you tell me why did you choose to use the “sur lie” technique in vinification of Malvasia? I opted for it since I want to make wines that are of longer lifetime, in contrast to the current trend in Istria to produce ready made Malvasia that can last at most 2-3 years. I don’t want that someone buys my Malvasia in a year or so in a supermarket and find it awful. The drawback is that it needs more time to become equlibrated and that’s why malvasia is not ready for the upcoming Vinistra fair in Poreč. But as a reward more complex aromas and flavors can be expected in the following years. Then he brought us Syrah from 2007, the wine he is so proud of that you could see it in his eyes. It was held in barriques for 12 months, then transferred to Inox barrels where it is right now. It will remain there until the end of this year when it goes on sale. Here are my tasting notes of “The beast” as he call it. Conclusion of this wonderful evening? Istria has just got a decent red wine that is not Teran. The future of the red wine here is going to be very exciting. Go Goran go! this is a great idea! I like the mix of receipes, and food and wine tasting. And your pics are very nice too. Merci beaucoup Clem! J’aimerais aussi écrire quelques posts en français juste pour que je n’oublie pas l’orthographie.